Chamber News, the Chamber’s weekly email newsletter, highlights area business activities; contains news from the Michigan Chamber of Commerce and the Michigan Economic Development Corporation; lists upcoming seminars, workshops and other events of interest to the business community; and enables members to share news about their businesses – expansions, new products, personnel changes, etc. It also provides promotional opportunities through display advertising. These early morning gatherings provide a tasty meal, updates on Chamber programs and activities, valuable information on timely topics, and an excellent opportunity to interact with other members of the business community. These events are a time for socializing, networking and refreshments. Typically held just after business office hours end at 5pm, the event provides opportunity for a Chamber member business or organization to showcase their facility. Held in the fall, the Annual Dinner enables members to celebrate the accomplishments of the Chamber year then drawing to a close, honor volunteers who have contributed to the achievements, mark the transition to new leadership, look forward to a new year, and enjoy fine food and fellowship. The Chamber’s Annual Golf Outing provides a fun, exciting way for business people to network in an atmosphere other than an office setting. Good food and a host of laughs are included. Member businesses are automatically listed in the Three Rivers Area Chamber of Commerce Community Profile and Membership Directory, a professionally-produced, magazine-style publication designed to promote the Three Rivers area and Chamber members. The alphabetical and “buyer’s guide” listings are free. Additional paid advertising is also available. Discounts are available for insurance coverage through Auto-Owners AFLAC and others . For a list of local insurance agents who market these programs to Chamber member businesses, contact the Chamber office. Chamber members and their employees receive discounts at fellow member businesses (restaurants, services, etc) by showing a discount card issued with your Chamber membership. Click Here for a list of participating businesses. The Chamber provides worldwide exposure for its members by listing them on its Web site (trchamber.com). 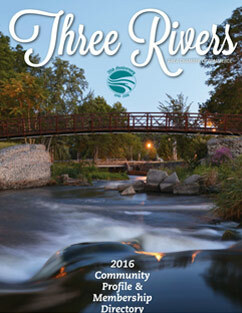 The site features information about the Chamber and the Three Rivers area. Additionally, utilizing area suppliers, there is discounted pricing for Chamber members to affordably establish their own presence on the Internet. Referrals are an important part of our member benefits. We receive many requests for information and refer them to Chamber member businesses. With the development of new membership software, reports of such referrals are available quarterly at no charge to you. The Chamber sponsors seminars on a variety of business-related topics, oftentimes in cooperation with the Center for Business Services at Glen Oaks Community College and the Sturgis Area Chamber of Commerce. These seminars provide an affordable means for upgrading the skills and knowledge needed to be successful in business.